We will be modifying our existing program from our PID loop instruction. Let’s get started. 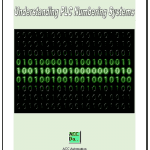 As a review, the following links will explain the PID instruction. 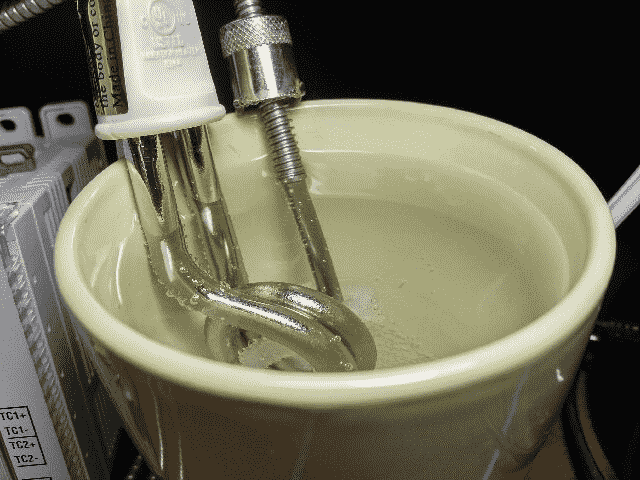 The last time we used the PID loop instruction on our immersion heater and cup of water. The thermocouple input provided feedback to our loop. 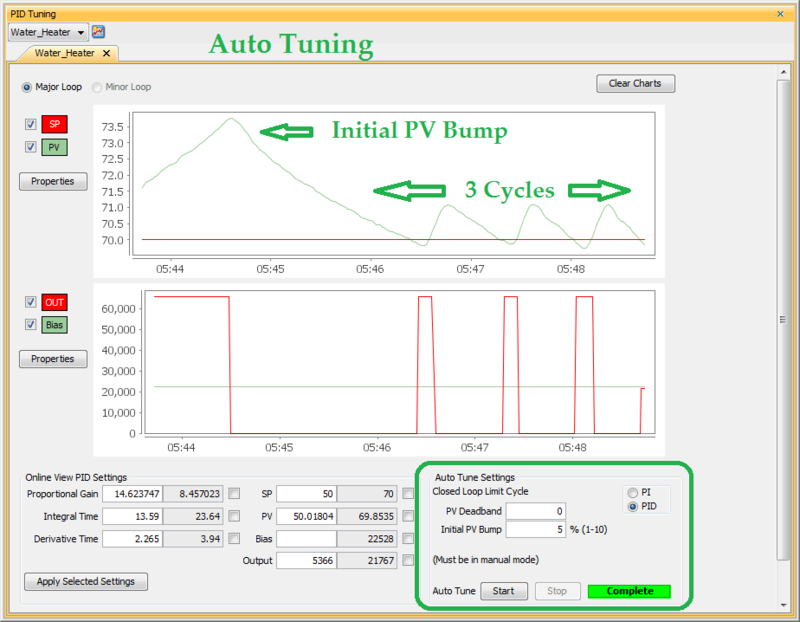 Auto Tuning was used to adjusting the PID parameters in our loop. We had an initial bump and then three cycles above and below the set point were observed before the auto-tuning was complete. During our PID loop operation, we observed the noise on the line for the thermocouple. We will now eliminate that noise by using the Average (AVG) instruction. An output from this instruction will be placed in the ThermocoupleAvgOutput tag. The average time for the input to be calculated will be 2000 milliseconds. This is the same amount of time as our time proportional output. 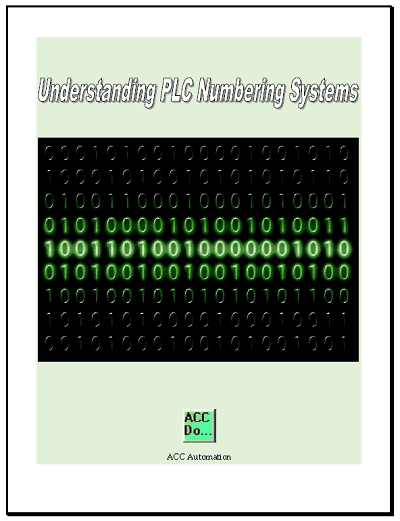 The average instruction will execute every scan of the PLC. The output of our average will now be the Process Variable in our PID instruction. The thermocouple input point AIF32-0.1.4.1 for our Process Variable is replaced by the tag ThermocoupleAvgOutput. We will use a structure for this instruction. The name will be Ramp_Soak, and we will have three steps. Number of Steps – 3 – This will set up the profile table with three steps. 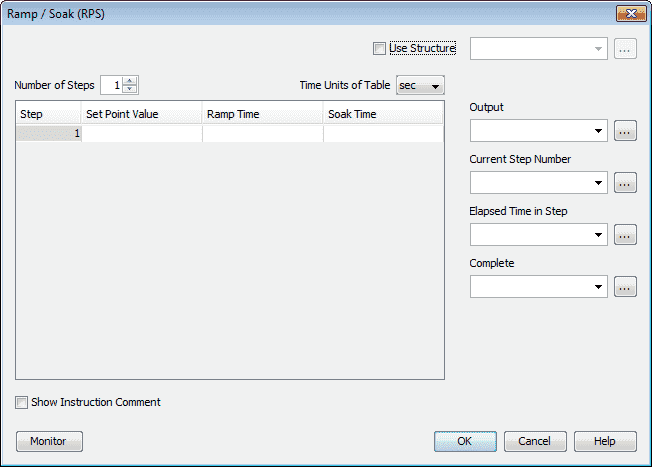 Time Unit of Table – sec – This sets the timing units for each of the steps that we program. Set Point Value – This is the setting that we want to go to in the step. Ramp Time – This is the time based on the time units select to reach the set point. 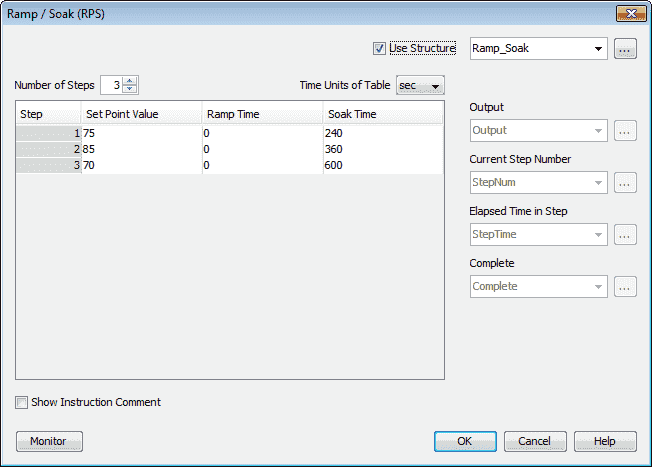 The output will go from the current value to the new value in the ramp time selected. Soak Time – This is the time based on the time units select to wait at the set point. After this time the next step is executed. Switch 3 will enable our ramp soak instruction. When Enable is ON, the instruction will operate every scan. When Enable is OFF, the instruction is not solved and its outputs are not updated. Switch 4 will run/pause our instruction. This must be on to start the timing cycle. Off will pause the timing. Switch 5 will skip a step in the cycle when activated. This is edge-driven. When Skip goes ON, the instruction immediately begins the next portion of the Ramp. If Skip is asserted while Ramping to Set Point, Output will move to the Set Point; Elapsed Time in Step will move to Ramp Time and the Soak Time will begin. If Skip is asserted while Soaking, the next Ramp Step Number will begin. When Switch 3 is on our ramp soak instruction is activated. We will copy the Ramp_Soak.Output to the PID1.SetPoint. When Switch 3 is off we will copy the value of 70 into our PID1.SetPoint. This will ensure that our water temperature is set to 70 when we are not going through our cycle. See the video below to watch our PID Ramp / Soak instruction in action with our Productivity 1000 PLC. Download the PID Ramp Soak Instruction program here. This concludes our Productivity 1000 Series PLC. We will add to this series as additional information or applications are required. Thank you.